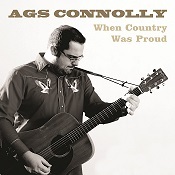 Earlier this year I reviewed Ags Connolly’s excellent first album, “How About Now”, which was produced by Dean Owens. The album opens with “When Country was Proud” and it’s a pretty good choice as the lead track for the EP as well; it’s very accessible (if you have the slightest leanings at all towards country music, you’ll be singing along) and it’s a manifesto for Ags and the Ameripolitan movement generally. The song harks back to the glory days of country with references to Johnny Paycheck, David Allen Coe, Willie Nelson, Waylon Jennings and Hank Snow, contrasting the outlaws with the sanitised state of modern popular country, and it’s difficult to disagree. On an album that’s absolutely packed with great songs, this one stands out as a single. The remaining two songs on the EP are from a solo session Ags did for Resonance FM earlier this year. “She Doesn’t Need Anyone Anymore” is a slow ballad about losing touch with a good friend, while the more uptempo “Trusty Companion” with its 60s sounding sus4 chords is a more hopeful look at relationships and possibly a companion piece to the album’s beautiful closing song “How About Now”. It’s interesting to hear these stripped-down live versions because they highlight the strength of the songs; if they work in that format, there’s no doubt that they’re good. The format also shows that Ags has a truly great voice for country music; with only an acoustic guitar for backing he sounds flawless. The single is certainly worth adding to your collection for the live session, but if you really want to treat yourself, get your hands on the 180g vinyl version of the album which is released on Monday November 10. “When Country was Proud” is out now on Drumfire Records.